A local band from Conche Harbour in Newfoundland, Canada plays their music for the guests at the Tuckamore Lodge in Main Brook. A band from Conche Harbour in Newfoundland, Canada plays their music in the entertainment area at the Tuckamore Lodge in Main Brook, Newfoundland, Canada. After a few songs, the band decides that it is time for the Screeching in Ceremony which everybody should get involved in and enjoy the festivities while visiting the Tuckamore Lodge. Screeching In Ceremony at Tuckamore Lodge, Main Brook, Northern Peninsula, Great Northern Peninsula, Viking Trail, Trails to the Vikings, Highway 432, Newfoundland Labrador, Newfoundland, Canada. 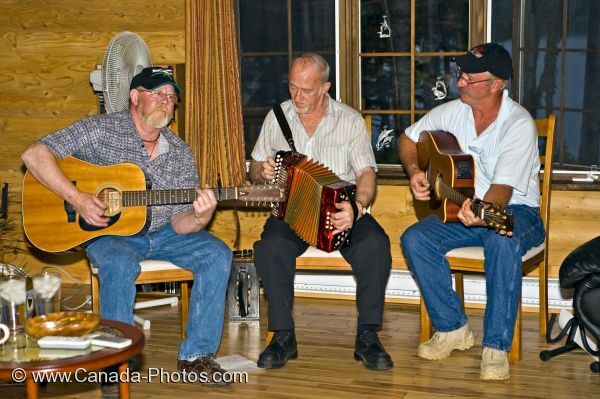 Picture of three men band performing their finest music at the Tuckamore Lodge in Main Brook in Newfoundland, Canada.